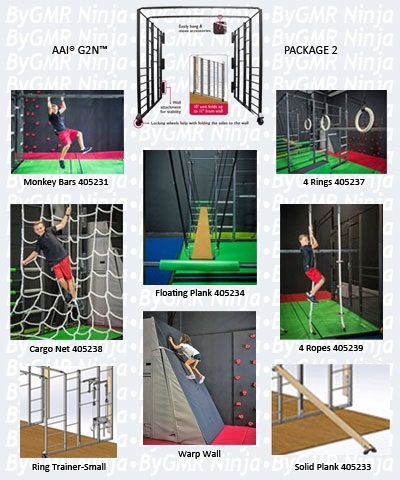 AAI® G2N™ is strong enough for adults, adaptable enough for children, and unique enough for Ninjas. It's built of high quality steel providing strength and durability, powder coated for durable clean appearance. Multiple attachments are easy to hang, adjust, or remove. Wall Unit - One Section - Built of high quality steel providing strength and durability. Powder coated for durable clean appearance. Conveniently mounts to the wall and folds out in minutes. Individual (2 piece) units occupy 10' x 10' area with 12 different mounting heights for attachments. Rung pads included for safety.